On October 8th 1995 we were for a weekend on the island of Vlieland. In the afternoon a Radde's Warbler Phylloscopus schwarzi was reported from the nearby island Terschelling. We could not charter a boat and the next day the bird was gone. This year we were on Vlieland again and it was the same story: on October 11th 1996 a Radde's Warbler was reported in the morning from the other nearby island Texel and again there was no possibility to twitch this individual! The best thing to do is to find one yourself: at 16:15 hours Ferry Ossendorp and Lammert van der Veen found a Radde's Warbler at the north-east corner of Vlieland. It was seen by another 20 birders (including me! ), but it was difficult to get good views of it. With lot of patience however, we managed to make a sound-recording and some pictures in flight (effort to catch it failed, but that story is only known to a few). On 12th October the bird was gone, but one was trapped that day at Zandvoort (Noord-Holland). Two others were trapped a week before on October 3rd 1996 at Kamperhoek (Flevoland) and at Laaxum (Friesland) just before October 31st 1996 (but were never submitted). 11 October 1996, Noordoosthoek, Vlieland Fr; © Hans ter Haar. Keep on trying Hans! 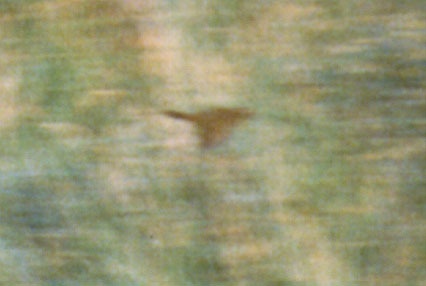 This record was accepted as the 7th record for the Netherlands at that time (cf Dutch Birding 20: 161, 1998). The first record ever in the Netherlands was on October 9th 1974 on Texel (Limosa 48: 171-173, 1975), the last twitchable on October 18th 1981 on the Maasvlakte (cf Dutch Birding 3: 109-112, 1981 and Dutch Birding 18: 277, 280 and 336, 1996). All records are exclusively in October. Radde's Warbler is much rarer in the Netherlands than its congener, the Dusky Warbler (Phylloscopus fuscatus), which has about 20 records so far in the Netherlands.